From bold colours, novelty prints and accessories there is a lot to love this season. OOO the 70s the decade I should have been born in. If you feel the same as me and are loving the 70s trend this season then think wide brimmed flop hats, deep deep v neck tops, flared jeans and tasselled leather or suede jackets . To add the summer edge to this amazing trend wear your leather or suede in some sugary tones of lilac and pinks, soo pretty! Think wide legged flares that start at the knee. Midi, mini or Maxi skirts & dress. Shirt dresses or just shirts and of course lets not forget the denim dungarees or jacket. 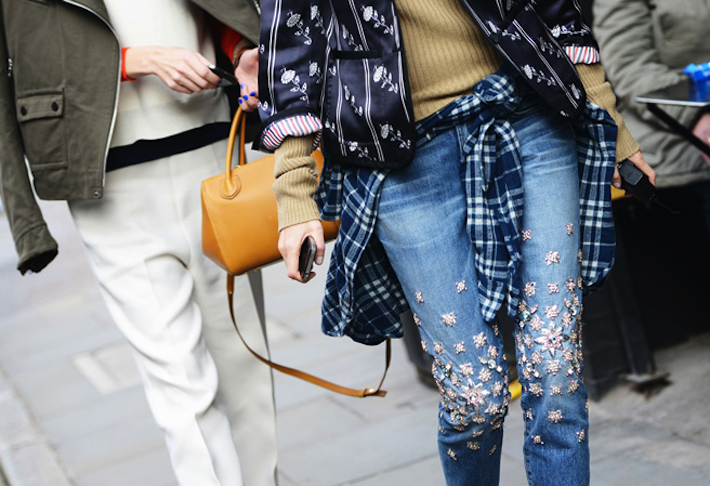 White, bleached, contrasting, distressed, patched or mid wash denim all goes this season and the best thing about this trend? It will be around along time. So you can invest in this trend with ease. Heels are becoming something of a rarity when look around the city streets, with fashionable feet all wearing trainers, something i like to call a trainer off. With so much choice now for us to dither over, everything from Nike classics to Chanel tweed glittery number and Dior sequin floral ones we really just don’t think there is enough time to work our way through them all. Being a fashion groupie has never been so cool. Think shaggy jackets, sky scraping platforms, ponchos, skinny scarves, slinky skimpy mini dresses, tassel’s and fringing galore. The only thing you will be saying is I’m with the band!